Don't go into hiding this holiday season. Use the extra food, vacations, and winter weather to your advantage! Here's how. The holiday season can mess with your fitness plans. Instead of ignoring every party invite and refusing everything outside your Paleo plan, try using some of the best holiday traditions to aid you in your fitness quest. I know it sounds crazy, but there might actually be a place for over-eating and skipping the gym in your fitness program. Here are five ways you can make the holidays work for you! Most of us celebrate the holidays with a big dinner. And generally, that dinner is anything but "light." When you sit down for what will probably be your largest meal of the year, you'll want to make sure your body is primed to deal with all the extra calories. The best way to help your body use those calories is by depleting muscle glycogen with a high-rep training session. If your workout comes before your big meal, the carbs from mashed potatoes, yams, and stuffing will go to restoring that muscle glycogen. 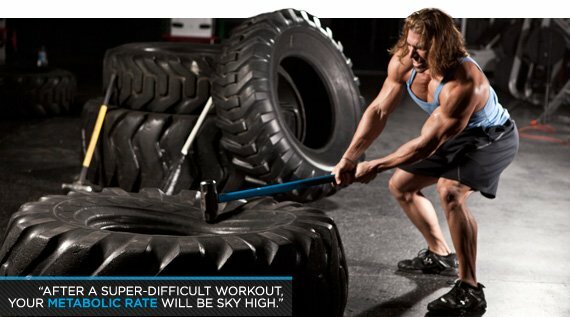 After a super-difficult workout, your metabolic rate will be sky high. If you eat when your metabolism is burning hot, your chances of adding body fat will drop. In that same vein, chomp your holiday treats after you've hit the gym. Whether it's a batch of Mom's oatmeal cookies or a decadent chocolate dessert, you'll do less damage if you can relegate the sugar to after your workout. Having a treat after training will increase insulin levels to deal with rising blood glucose. At this key juncture, the extra sugar will help your muscles quickly re-saturate with glycogen. If you can, choose treats that are lower in fat. Obviously, that's not always possible, but taking that option will better reduce your risk of carry-over fat gain. Since you'll be taking in more calories on average during this month of the year, why not use them to your advantage? Instead of fat loss, focus on building. To increase your muscle mass, you'll need to eat more. Get those extra calories from the rich holiday meals you'll enjoy in November and December. Use a staggered set-up for your bulking period. On the days you have parties or events planned, plan an increase in calories. The days that are Christmas-party free can be used as low-calorie days. This diet plan makes going to holiday functions much less stressful. Your low-calorie days will set you up for no-guilt increases on party days. A well-structured workout program should incorporate a deloading week. Deloads are periods where you back off heavy weight training and maintain lower-intensity workouts with lighter weights. These periods allow your body a chance to fully recover, even if you're still going to the gym. If you're going out of town for the holidays, incorporate a deloading week. That way, you don't have to worry if you're not near a gym. You can keep up with your program using bodyweight exercises instead of dumbbells and barbells. Try doing a circuit of air squats, planks, push-ups, and lunges for a deloaded training session. Instead of scheduling time to complete cardio sessions in the gym, save them for the weekends and outdoors. Sunday afternoon snowshoe adventures, sledding with your kids, or an afternoon on the ski hill can replace, diversify and enhance a treadmill cardio workout. Whatever selection you make, make sure it's for longer than 10-15 minutes. Utilize the winter to help maintain or build upon your fitness—that way, when spring rolls around you'll feel great.